Reiki is a form of energy healing that was discovered by Dr. Mikao Usui of Japan in the early 20th century. Rei means higher intelligence or subtle wisdom. Ki is defined as energy or life force. Ki is also known as chi or prana in other cultures. Reiki can be translated as spiritually guided life force energy. Yes; reiki heals mind, body and soul. It’s a safe and natural healing modality that helps relax, connect to your true essence, and allows the body heal itself. Reiki can bring emotional balance, clarity, and self-awareness. Reiki also balances the chakras and the auric field. 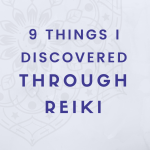 Studies have shown that reiki is effective in managing pain, anxiety, and irregular heart rate, blood pressure and salivary cortisol. There are five elements that are the foundation to the system of reiki. While reiki is a spiritual practice, it is not a religious practice. It has no dogma that you must believe. You can practice reiki alongside any religion or none. What is the source of reiki? Reiki does not flow from your practitioner. Your practitioner is simply a channel through which reiki flows. The source of reiki is the divinity that you find within yourself and around you. This can be your Highest Self, the Universe, God, “all that is” or any higher source you believe in. During a reiki session, the recipient will either lie down or sit in a chair while fully clothed. The Reiki practitioner will place their hands gently on the recipient’s body, or just above the body. The practitioner will typically change the positioning of their hands several times as the treatment progresses.You may feel some warmth or coolness,tingling, or simply relaxed. Some people may see some colors or visuals.